But Does it Deliver the Package? Before you jump to conclusions this is a review of the new Trey Shults film, not a recent Grindr Hook-up. Although much like with online dating what you are promised in the preview isn’t exactly what you are going to get. Everything from the jumpy tense trailer, the ominous film title and the classically creepy cabin in the woods setting suggests you are in for a paint by numbers horror film to appease the masses. The film, however, is far from that date night horror flick. Instead of leaving the cinema with the euphoric high of surviving something terrifying I was left with a sense of melancholy, questioning just what mankind is willing to do to survive. However unlike many hormone ridden teens who will see this film I couldn’t be happier with the deception. The intensity in the trailer is there but it is strung out with a sense of foreboding and dread that keep you consistently anxious without any jump scares to relieve the mood. Instead the cheap scares are replaced with well-developed characters, who are very well acted and have clear motivations. I know – it’s a revolutionary concept. I wouldn’t like to pick out one actor as being particularly great as the limited cast all have a chance to shine and all do a great job of absorbing you into the world without a long winding backstory. In fact there is next to no back story for the characters or the plot. The plot consists of a family of four and their dog in their wood cabin hiding from a deadly disease that is killing all those infected in a short space of time. This has caused many to abandon their city homes and flee to the countryside. The film opens with the mercy killing and shallow grave cremation of the grandfather which leads to their home being discovered and broken into by a young man. After initially tying him shirtless to a tree and stuffing something in his mouth (I would have done the same) they make a gentleman’s agreement to share one family’s livestock with the others’ fortified shelter. The rest of the film is just exploring the bonding and distrust between the two families and the consequences of their actions. This disease epidemic plot isn’t given to you up front in a traditional outbreak scene or even via a news source exclaiming the inner city horror. It is slow released throughout the film with neither the scale or the nature of the disease being fully explained. In a very similar way there is no backstory for the characters. The main family – Paul, Sarah and their teenage son Travis are given no concrete life history. However a happy past is cleverly suggested by a long corridor filled with smiling family portraits that instantly and subtly tells you everything you need to know. The second family – Will, Kim and young son Andrew’s past is given more of an explanation as Will tells his family’s story to gain Paul’s trust. However a slip up by Will after a drink later suggests the only concrete back story we are given could all be a fabrication. The set design of the film is perfect. Slopping ceilings, small hidden crawl spaces and the heavy red foreboding door create a sense of claustrophobia, dread and give a disorienting vibe. Apart from the aforementioned family portraits the only other decoration in the dimly lit cabin is the Bruegel The Elder painting “The Triumph Of Death”. 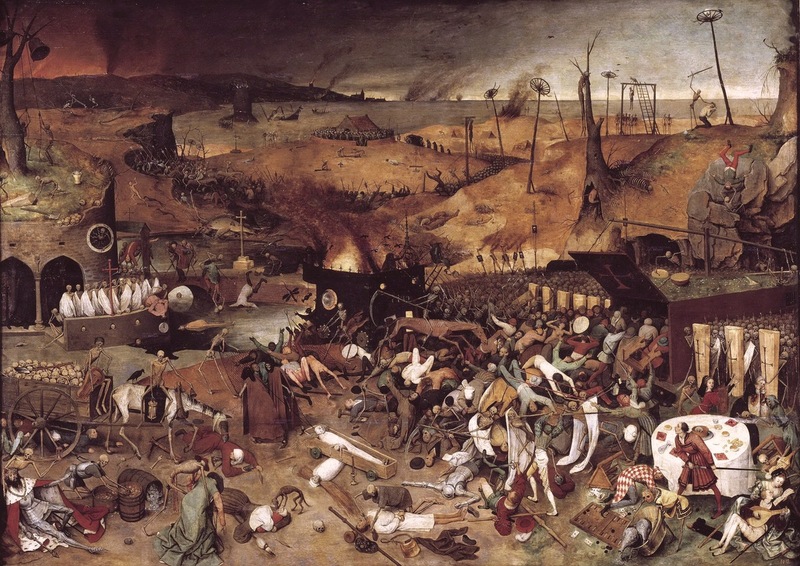 Apart from just being a hellishly depressing image of the destruction man this particular piece was chosen because Bruegel was inspired to paint it by the Black Death Plague. It is this level of thought and attention to detail that permeates through the film and keeps it engaging and thrilling. Perhaps the weirdest false advertisement around the film is the title. Nothing does actually come at night. There is no zombie like creature or attacks from others at night despite stating they don’t go out at night (not even to the outside toilet). The only thing that does come at night is Travis’s beautifully visceral nightmares that explore his grief, fears and desires. It’s the part of the film that cements its horror status and without it I’d be hard pressed to call this anything more than a tense family drama. I don’t mean that as a negative by the way, the family drama is what makes this film so engaging. Whilst Travis’s parents argue about the current situation making their son grow up too fast it is clear that Travis himself is ready to grow up with his feelings of sexual desire obviously developing throughout the film specifically targeted at Will’s wife Kim. This is shown in a great and awkward kitchen scene between the two characters as well as Travis actively listening in to a late night interaction between Will and Kim, vicariously experiencing their intimacy. Without heading too far into spoiler territory I can tell you the blissful family interactions – like suggesting they guess who’s poo bucket is who’s – doesn’t last. With the fear that someone may be infected the family’s distrust of each other is immediately heightened with horrifically sad consequences as the two families throw morality aside and fight to survive. The closing conflict does a lot without showing much. Instead of giving us a money shot, letting the actors explain the horror with their distress actually keeps the situation grounded, real and all that more harrowing. The film ends similarly to how it opens, around the dining table – no clearly explained ending just as there was no clearly explained beginning. The surviving characters are left to continue on with life as it is now and to comprehend what the horrors they have done to survive. Like with most films that are downbeat dark but strangely beautiful I’m left with both a sense of enjoyment and sadness. If the question is would I watch the film again I’d say no, once was probably enough (twice at the most) to experience what it has to offer without becoming manic depressive. But if you asked me if I thought the film was good and would I recommend it to my friends then I say….